My intent was to start with the guys that probably influenced me in a thousand untold ways, people I read and loved as a kid and probably copied or imitated. Many of whom I haven’t really tapped into since I was 12. Then I wanted to move into people who are more obviously an influence, people who’s styles I’ve conciously borrowed techniques/renderings from. I will borrow a rendering style from an artist but i try and keep my art style – the actual shape of my drawing – my own. But, of course, it’s already been influenced by those that have gone before. When I started reading 2000AD, Steve Dillon was the guy I most admired. I’m not sure why, he’s probably one of the least showy of the 2000Ad artists on Dredd at the time. But his work was rock solid, easily digested and, I hope – gave me a good story telling foundation that I tap into to this day. Dave Gibbons and Ian Kennedy were two of the main people on Rogue Trooper (along with Brett Ewins) and, when Rogue turned up, Dredd didn’t really get a look in from me. Even now, much of that work can still be looked at as a high point. Ian Knox – is a Belfast cartoonist who, these days, is mostly known for political cartoons, but, when I was a nipper, Ian was drawing “Cheeky” and a whole bunch of other weird, goofy, freaky humour strips for IPC/Fleetway (always to be replaced by cheaper and less talented knockoffs – but his line was unmistakable). Gil Kane – picked up his art sometime in the late 80s – though the work of his I was looking at was probably from the 70s. Alan Davis – first saw him in 2000AD, and loved Captain Britain. Arthur Rackham – Children’s book illustrator, and one of the first artists biographies I ever owned was about Rackham. Incredible gnarly trees. John McCrea – John’s art style has probably seeped into mine, as I’ve been friends with him a long time. He moved off to England when I was in my 20s, but he pops back to Belfast and we meet and chat and he’s a great bloke who I’m proud to have as a friend. Mignola – show me an artist not influenced by Mignola. They LIE!Gary Leach – 2000Ad/ The VCs/The Warpsmiths. Gary has a beautiful smooth line that’s distinct enough that I’d recognise it even in that snippet of leg. Gabriel Ba – somehow more three dimensional than Mignola, but obviously influenced by him. Mike McMahon – when I was younger I never really ‘got’ McMahon – I think I was blown away by his Slaine work, but I wasn’t into fantasy – so I mostly ignored it. Now, of course, you can see the genius in everything he did. I’ve borrowed a surface scratchy style from him – a style he did by accident when inking with pen, I’ve borrowed and, hopefully, it’s part of my repertoire now and not just a simple life from Mike. Mike Western – I loved war comics, Warlord, Battle and Commando – were all with me before 2000AD. And, while I probably didn’t connect the name to the art then, the art is so recognisable to me that a quick trawl through http://britishcomicart.blogspot.com/ was able to turn up names and art that I knew I loved as a child. Chris Sprouse – gorgeous clean line, no way to hide a weak drawing with that line! Kevin Nowlan – beautiful inking. I once deliberately tried to mimic his inking style on a Judge Dredd strip and, got to show him the work – he said he liked it, I mumbled that I had a copy of his art on my desk at the time of drawing it. Then I slunk off like an idiot. Duncan Fegrado – I’ll be honest, I love Duncan’s work – but have no idea how I’ll steal what he does for my own use. But I’ll figure it out eventually. Joe Culquhoun – Like Mike Western, Culquhoun is a war comic artist that I was always attracted to. 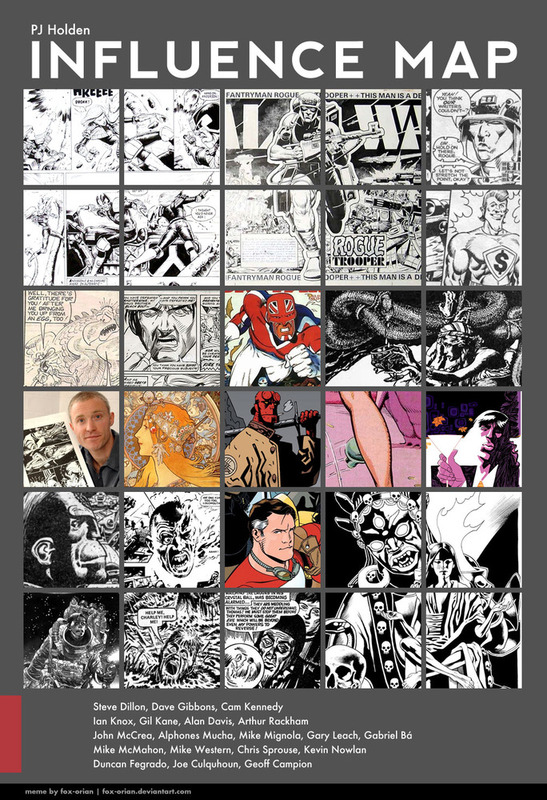 And, looking at his art, Mikes and Geoff Campions art – it strikes me that the goofy faces, broken noses and general lumpiness of the faces is really something that’s embedded in my art. Geoff Campion – My reading history is a little odd. Much of what I read as a child – in the mid/late 70s, really comes from the 60s, as my dad would often buy me old Lion/Victor/Valiant annuals, and looking for artist and art that I recognised keep turning up the same handful of names, Campion is one of them. I now throw the floor open for discussions!